Does Birth Order Shape Our Personalities? I just got back from a 5 day trip to California. My cousin Peter was getting married to Jennifer. I decided to make it a mini vacation and check out the Poker scene. 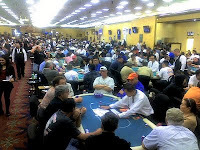 As it turns out the Los Angeles area has the largest poker rooms in the world. The Commerce Casino and Bicycle Club and the number one and two Poker rooms in the world. I would agree. If you want Poker action, then Los Angeles is the place to be. It even beats out Las Vegas, because there is less competition and more concentration of players. The Commerce was amazing. I went there on a Thursday night after the Rehersal dinner and the place was packed. Over 100 tables playing all sorts of Poker games. I asked a regular there if it was always like this and he said yes. There is alwasy action at the Commerce. I wanted to play $1/$2. I was disappointed that the maximum buy in was only $40. It's hard to make a move with such a small stack, but they started a new table and everyone bought in for $40. I made a little head way hitting quad fives, but then lost it all after I flopped 2 pair in the small blind and someone under the gun flopped a straight. I stayed in Bell Gardens at the Comfort Inn. It was directly across from the Bicycle Club casino. This is the number two poker room in the world and was told the best. They did not have a $1/$2 game, but a $2/$3 game and you can buy in for $300 max. All the food was comp and the action good. I spent most of my time there. I started out strong, but quickly went away. I had my Aces cracked and just could not get anything going for the first few sessions. My last session I had my game back and managed a modest come back. For the entire trip I lost a little money, but was still up for the month. It was fun, just not to profitable. Here are some random pics from the trip. I am playing Omaha tonight online and got really lucky. I cracked 3 sets with a straight on the turn. My online name is nguyen1972. All I can say as atleast the best starting hand won. I did have pocket Aces... As I usually do...lol.. I pot it pre-flop and push all-in on the flop. I was first to act and unknowingly both guys hit there set to pay me off.. Actually the one guy hit a set of 10s and Kings.. Sick.... Oh by the way, it is my birthday in 2 days.. maybe I am getting lucky because of that.. They say always play on your Birthday. Two years ago I hit a Royal Flush 2 days before my Birthday.. I guess I am lucky.. I stuck to my guns. I told myself that if I ever make more then $200 in one session that I would not play the next day, since I tend to give it back way to easily. I played Thursday night and made $300. I decided to take Friday night off. My roommates didn't make it easy on me. Their originally plans were cancelled and they decided to go to Coushatta Casino, in Louisiana. It is about a 6 hour drive from Austin. I was really tempted to go with them, but decided to just relax at home and enjoy my previous night win. I did play on Saturday and actually started playing around 4pm. The game from Friday night turned into Omaha and was running all night and morning long. I jumped in with $200 and quickly loss it all, chasing to many draws. I bought back in to $150 and started losing that too. So I started playing tighter, back to basics. Then the cards started hitting me, Aces doubled suited a couple times. I slowly made it back to over $300 in front of me. The game finally ended and I had about $315 in my stack. I was only $35 from break even for the session. I went to the holdem table with the goal of just breaking even and then leaving. I kinda felt like I couldn't win today, so getting to even would be fine for me. My first hand was pocket fives. I was in the big blind and Stan raised it up to $17. I felt Stan was running the table since someone commented that Stan was raising doing his standard thing and raising it up big. Everyone folded behind him and I was last to act. I figured I call with my pocket pair, hoping he just had a big Ace. The flop came 2♣3♣6♥ and I check. Stan bets out $25. Now I put him on an over pair, but I am not sure. I make a loose call hoping for my gut shot and that he would check the turn if he did just have Ace high. The turn is 8♣, making a flush possibility, so I check it. Stan checks behind me. The river is the 5♣! I just hit my set, but now there are 4 clubs. I make a value bet of $25 into a $84 pot. Stan says he is making a donkey call without a club. He had pocket Jacks and no clubs.. I take down the $130 pot, now I am a bit over break even. Sorry Stan.. sometimes a Donkey can get lucky too..
Now I should quit, but I cant quit after winning a good size pot, so I continue to wait for my hands. Not less then 30 minutes later I have pocket Aces in the big blind! Eric raises it to $20 and one other guy calls $20. This is a major raise in $1/$2 game and I put one of them on a big pair. I just broke even and really don't want to see a flop, so I re-raise to $120, thinking these guys should fold to that. Eric surprises me and goes all-in for about $90 and the other guy folds. I show him the nuts and Eric has the ladies. I asked him "What did you think I had?.." Eric plays enough with me that he knows how I play, but he still has to see a flop with Queens. He has money and it doesn't mean much to him, $90. Well, I hit my set on the flop and boated on the turn. 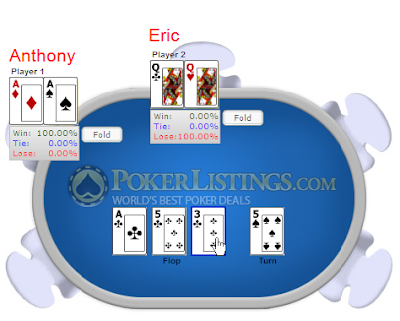 There were 3 clubs on the flop and Eric did have one club. But on the turn he was drawing dead.. I take down the $220 pot and now have close to $500 in front of me. I play a bit longer hitting pocket Queens under the gun when a guy straddled it $10. I raise to $40 and everyone folds except the straddler. The flop is all rags and he folds to my continuation bet. 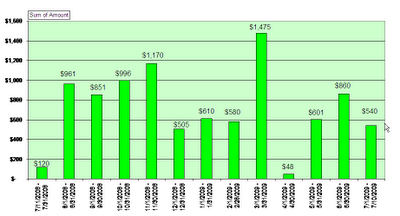 Now I have a profit of $145 for the night, thanks mostly to my Facebook friends. I was greatful to make up for my initial losses, but what a roller coaster ride. That is how it is with Omaha and no-limit games. You have to be able to take the swings. I cant stop thinking about this hand in Omaha on Saturday afternoon. 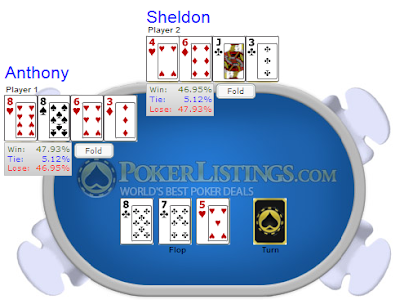 I flop top set and Sheldon flops a straight. I was first to act into a $65 pot. I pot it and Sheldon re-pots it and I call. The pot is now close to $600. We decide to deal and run the turn and river three times. I boated on the first turn and Sheldon takes the next two runs. I did the odds and it looks like I had the slight edge, so I should not have made the deal.. What would you have done? Deal or no Deal? It was a good night for me. I decided to fire up Poker Stars and play some Omaha online. I had about $160 left in my account from over a year ago, yes I have not played online in over a year. I was glad I had remembered my online name and the cash stayed in my account. I decided to give six handed, pot limit Omaha a try. 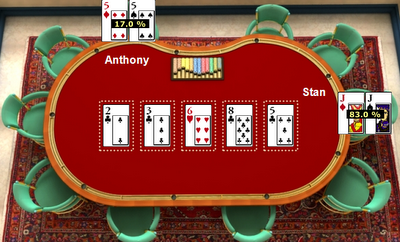 Hold'em online is way to tough. You have to be really patient and their are so many sharks that it is tough to make any money. It is a slow and painful game and I was never successful in the past, even with software that help me know who the sharks were. On the other hand, Omaha has no such software and I think I have an edge. I still play tight and only the nuts. People are generally more loose, yet more tight when it comes to folding.. And lately, I have been doing well online. Let's see how it lasts. I had over $200 last night and got my account over $400 for the first time. I asked for a cash out and we'll see how it looks when I get a check. It will be my first time cashing out online. After making my killing, I decided to head to the Retreat and play some round by round. I bought in for $200 and it was 2nd highest chip stack at the table. I played tight and lost to a short stack in holdem after he hit a set of 222s and I hit my King with AK. Shortly afterwards I got my money back from the same guy when I turned top set of 999s in Omaha. I think he had pocket Aces in the hole. I hit another quad, 9999s in Omaha while in the small blind. I flop at set, the turn created a potential straight and I check it. The button pots it to $65 and I call. The river is the case 9 giving me quads. I push all in and he folds.. He said he had straight draw and flush draw... I think this is like the 4th time I have hit Quad nines.. In Hold'em I get pocket Aces in the Big Blind. Three people in front of me limp in and I raise to $45. Everyone folds except one short stack. He pushes all-in for another $15. I hit a set of Aces on the flop and he never shows.. German (Mike) comments, "and you still get action.." Knowing that when I raises it, I usually have the nuts and most people know this about me, yet I still get action.. I say, "It's because some people can't resist cracking me, even tough they know I have them beat.."
The very next hand I get pocket Queens. One guy raises it infront of me $17 and I re-raise to $45. This time everyone respects my raise and folds. The raiser folds, saying he had Jacks.. He also says that I only play 3 hands. Aces, Kinds and Queens.. Now that is respect, good fold! Poker sharks are commonly described as tight and aggressive: "Poker pros do not play many hands, but when they play them, they play them like they have the nuts." A solid poker player is one who has mastered the following four key skills of poker. • A solid poker player knows the general probabilities of the game. For example, they know that you have about 1 in 8.5 chance of hitting a set when holding a pocket pair, and that you have about a 1 in 3 chance of completing a flopped flush draw by the river. • Good players understand the importance of outs. Outs are simply the number of cards that will improve your hand. Count your outs, multiply them by two, and add one, and that's roughly the percentage shot you have at hitting. • Good players can figure out the pot odds. Knowing outs is meaningless unless it's translated into rational, calculated betting. Knowing you have a 20% chance of hitting, what do you do then? If you're not sure, check out our Pot Odds article. • Math skills are the most basic knowledge; it's day-one reading. Anyone who doesn't understand these concepts should not play in a game for real money until they do. • Good poker players demand an advantage. What separates a winning poker player from a fish is that a fish does not expect to win, while a poker player does. A fish is happy playing craps, roulette, or the slots; he just hopes to get lucky. A poker player does not hope to get lucky. He just hopes others don't get lucky. • Good poker players understand that a different game requires a different discipline. A disciplined no-limit player can be a foolish limit player and vice versa. 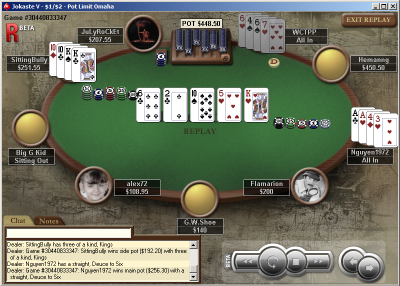 For example, a disciplined limit hold'em player has solid preflop skills. When there is not much action preflop, he or she only plays the better hands. When a lot of people are limping in, he or she will make a loose call with a suited connector or other speculative hand. • A disciplined player knows when to play and when to quit. He recognizes when he is on tilt and is aware when a game is too juicy to just quit while ahead. • A disciplined player knows that he is not perfect. When a disciplined player makes a mistake, he learns. He does not blame others. He does not cry. He learns from the mistake and moves on. • A disciplined player knows when to flod em. Sometimes when you are beat, you are beat and have to make big lay downs. • Knowing the answer to these questions is the first step, manipulating the answers is the second and more important step. Suppose that you have a pair of kings and your opponent has a pair of aces. If you both know what the other has, and you both know that you know what the other has, then why play a game of poker? A poker pro manipulates the answers to questions #2 and #3 by slowplaying, fastplaying, and bluffing in order to throw his opponent off. • Good poker players know that psychology is much more important in a no-limit game than in a limit game. Limit games often turn into math battles, while no-limit games carry a strong psychology component. Thus, poker tells are much more important in no-limit games. • Pot odds and demanding an advantage fall into this category. Poker players are willing to take a long-shot risk if the reward is high enough, but only if the expected return is higher than the risk. • More importantly, they understand the risk-vs.-reward nature of the game outside of the actual poker room. They know how much bank they need to play, and how much money they need in reserve to cover other expenses in life. • Good poker players understand they need to be more risk-averse with their overall bankroll than their stack at the table. Eldest children are socially dominant, highly intellectual, and extremely conscientious. Unfortunately, they’re also less open to new ideas, and prone to perfectionism and people pleasing—the result of losing both parents’ undivided attention at an early age, and working throughout their lives to get it back. Middle children, sandwiched between older and younger siblings, often develop a competitive nature,making them natural entrepreneurs later in life. They tend to be the most diplomatic and flexible members of the family and often, eager for parental praise, develop musical or academic gifts. Youngest children, according to birth order theory, tend to be dependent and selfish—as they’re used to others providing for them. But despite the negatives, they’re also quite often the life of the party—fun, confident, and comfortable entertaining others. And only children? Like last borns, they are regularly spoiled, according to Adler, and have a hard time when they don’t get their own way. School can be a particularly difficult transition, as they’re used to being the center of the familial universe. But all that parental focus pays off. Only children are often mature for their age. They wow people with their vocabularies and their comfort in adult circles. Plus, all that self-entertaining fosters creativity. Hey Baby, What’s Your Birth Order? This is my most favorite place to play poker in Flint, MI. It was robbed last night and the guy was shot dead by a retired police man playing there. BURTON (WJRT) -- (07/01/09) -- A shooting at a Burton poker room has left one person dead. ABC12's Marc Jacobson says an unidentified gunman began shooting through the glass in the front of the Palace Poker Room in the 1100 block of Bristol Road at around 1 this morning. A witness says the masked man, armed with a shotgun, shot out the front door of the building, walked in and fired at least one round into the ceiling. The gunman told the 30-60 people inside to hit the floor. More rounds were fired before a retired police officer, who was armed, shot and killed the gunman. Police believe the gunman could be the same person who robbed the poker room last month.